More than 596,600 units of intermediate bulk containers were sold in 2018, which are likely to witness around a 6.3% increase by the end of 2019. 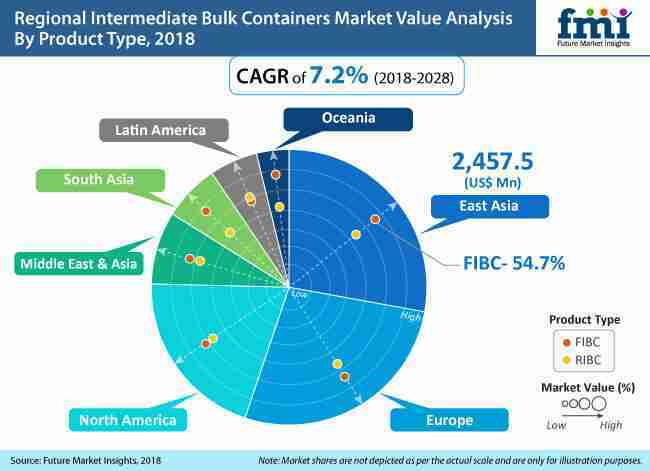 According to a new research study presented by Future Market Insights (FMI), the global revenue of intermediate bulk containers (IBC) market is set to cross a US$ 10 billion market by 2020. Accounting for an approximate value share of 80%, collectively, food & beverages, industrial chemicals, and building & construction industries remain predominant consumers of the intermediate bulk container market. A majority of intermediate bulk container demand remains concentrated in food & beverages, industrial chemicals, and building & construction industries, as indicated by the study. IBC adoption in the F&B industry is, however, witnessing a higher annual growth rate, says the report. An additional benefit in terms of transporting and warehousing space consumption is also cited as an important factor pushing the adoption of paper intermediate bulk containers among food and beverages industry operators. According to the study, the majority of Europe’s intermediate bulk containers demand relies on imports from South Asia. While Western Europe’s demand for intermediate bulk containers is on the brink of maturity, the impressively growing acceptance of non-plastic IBC alternatives is posing a significant impact on the growth of Eastern Europe’s intermediate bulk container market. Holding a prominent position in the intermediate bulk containers export scene, South Asian countries – especially India, are projected for an impressive growth outlook in the global landscape over the course of coming years. Expanding manufacturing industries, rampant growth of the building & construction vertical, and strong presence of major F&B industry operators are favoring the demand growth of industrial bulk containers market within the region. Intermediate bulk container manufacturers are likely to collaborate with shipping companies over the development of tracking-enabled intermediate bulk containers that update the precise status of packaged products directly to customers. A few prominent players currently involved in R&D of RFID enabled IBCs are Metano IBC Services, Inc., CHEP (U.S.A.) Inc., and Hoyer Group. Driven by the rapid growth of small scale manufacturing sector worldwide, economic opportunities residing in renting, reconditioning, and refurbishing of RIBCs are projected to attract leading companies as well as retailers and distributors active in intermediate bulk containers market. Industry giants such as Mondi Group, BP Polymers, Schoeller Allibert, and others continue to augment investments in IBC material innovations and new product launches in the intermediate bulk container market.